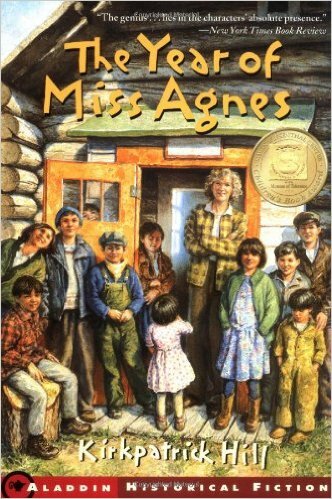 I picked up a copy of The Year of Miss Agnes on a whim. I was visiting a friend in Northern Idaho and we went to her hometown bookstore (which is, in my opinion, the best bookstore in the entire country). The owner of the bookshop, while not very talkative or friendly, clearly was a reader and the shelves were filled with books I'd either read myself or knew to be quite excellent. (See? We had similar tastes. Clearly it was the best bookstore in the country! You doubt!?) I hadn't ever heard of The Year of Miss Agnes before but the selection of books upon his shelves recommended this tile to me. It was a safe bet that I was going to like it and like it I did! The Year of Miss Agnes is a short and simple story told from the perspective of ten year old Frederika (Fred). The story opens with Fred explaining how many teachers have come and gone from their village's one room schoolhouse out in the Alaskan wilderness. Recently the village lost another teacher who couldn't hack the conditions of the community. A new teacher by the name of Miss Agnes was being flown in to try her hand at teaching in the area, and Fred is wondering just how long she'll last. Expectations in the village are low but Miss Agnes seems to rise to the challenge. As it turns out, Miss Agnes isn't like any of the other women who have come to teach. Hailing from England, she doesn't seem at all put off by the environment but chooses instead to focus on the adventure of it all, desiring nothing more than to foster a love of learning in her pupils. This is a sweet story and, at 113 pages, a fast read for an adult. I read it first and then handed it over to Bookworm1 (age 10) who also polished it off in short order. It's easy to breeze through and enjoy this book. 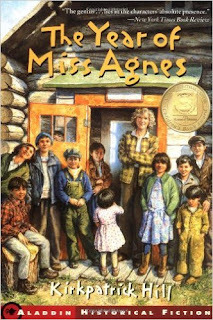 The Year of Miss Agnes is a story about a passion for learning but even more so, about the powerful influence that a teacher can have on the life of their students. I loved this one and am happy to recommend it to others. If you find a copy, pick it up! I sure am glad that I did.